We offer complete Porsche engine rebuilds and performance enhancements! Our facility is about 1,000 square feet, with a dedicated clean room for engine assembly that is all stainless steel and polished pipes, similar to an operating room. 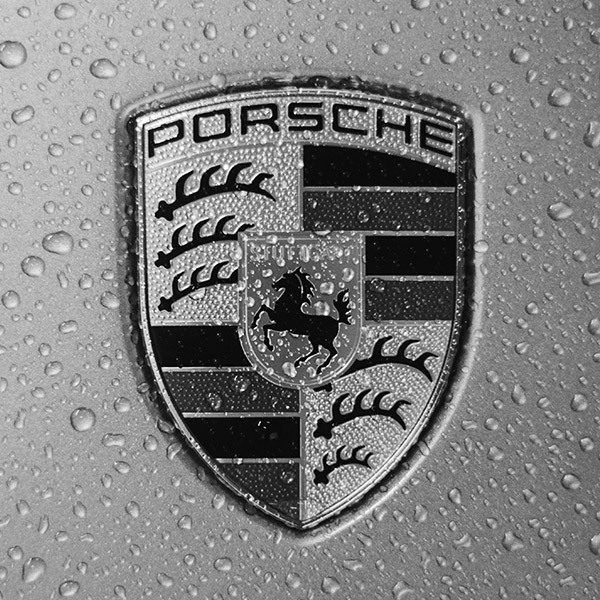 Porsche (correctly pronounced like the feminine name Portia), is undeniably the most successful brand in motorsports, being the world's largest race car manufacturer. Obviously, the heart of every Porsche is its engine, and like every vehicle, over time engines either wear out or parts break. In either case, BreitWerks in Melbourne can fix it! Usually, it is obvious when they break since that usually ends on a tow truck. Wearing out isn't quite as obvious. Hard starting, poor gas mileage, poor performance, smoke and leaks are signs that your motor is getting tired. Precision motors tend to have catastrophic failures that cause tremendous replacement costs. It is much more cost effective to rebuild a tired motor than to have to buy a new crankcase to replace yours that has a connecting rod sticking through the side of it. Here at BreitWerks, you can rest assured that your Porsche engine is in the best hands possible. Every part that we touch gets cleaned and assessed for condition. Sometimes, all it may need is a little glass-bead blasting and some powder coat to make a part good as new. Other times, the only option is to replace the part with a new version. BreitWerks ensures that the only parts going into your project are as good as, or better than, the original equipment. In certain scenarios, the aftermarket provides a higher quality product. BreitWerks will always discuss your options and keep you apprised at each step of the process. BreitWerks engine failure forensics allows you to have the confidence in knowing that the cause of the failure effect has been removed, replaced, or corrected. An engine is a precision piece of machinery that requires a proscribed assembly process that includes cleaning, measuring, sealing and torqueing various parts. 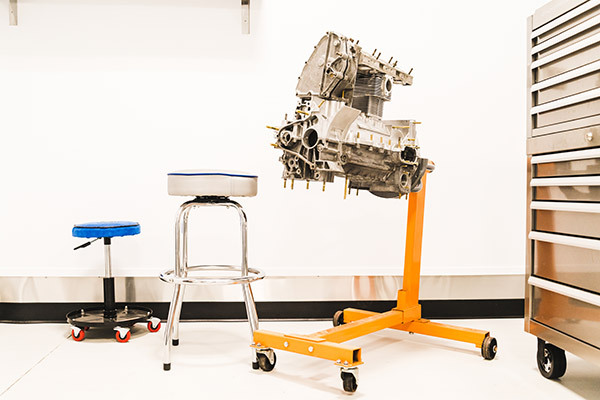 BreitWerks has state of the art tools and a clean room for critical engine component assembly. Our assembly techniques include a mixture of factory methodology and lesson learned during past projects, as well as collaboration with other builders around the world. As we all know, Porsche engine parts run pretty expensive, and since the newest air-cooled engine is approaching the ten year mark, many owners will want to get ahead of the potential problems. Many Porsche engines may need valve jobs, or even complete engine overhauls, and since these cars have become much more affordable, you may choose to upgrade when doing so. Since the technology has been decades in the making, the aftermarket has manufactured some excellent products to increase reliability and enhance performance. Many of the issues we have been seeing derive from unfamiliarity with the basic design and construction of the Porsche engine, but BreitWerks can meet any and all of your requirements when rebuilding your engine: if you do it right the first time, you shouldn't need to do it again! BreitWerks evolved out of a belief that sound Project Management principles can be applied to the automotive repair industry. If the manufacturers can do it in the original design and fabrication of the vehicle, why can't PM work for the entire lifecycle? Answer: it can! BreitWerks spends time with each client to understand objectives, layout options and help with the selection of an implementation solution. The difference in time between a straightforward reseal/rebuild and a big power build could be months. There are consistent items that are easy to estimate and there are unique items that will require a little more leeway. At a minimum, BreitWerks will keep you apprised of progress with a weekly update. Everyone in this industry knows that you cannot give a complete estimate until you have taken apart the engine. It shouldn't take a month just to get the engine torn down. Once we accept your project, BreitWerks will have your engine torn down and inspected within a week. At that point, we call you for an approval and once the decision is made, long lead parts and services are underway. It does not take six months to build a reliable, stock engine. BreitWerks is here as your option for a quality, efficient rebuild. Your motor spent many years on the drawing board in the design and development phase. It was tested under the harshest environments possible. Your motor is an engineering marvel. And, BreitWerks can make it even better. Years of experience and a genuine passion for getting "more" allows BreitWerks to help you select the most effective strategies. Software upgrades are a non-invasive way to gain performance. BreitWerks has relationships with different vendors and depending upon your goal, we will select the most effective option with you. With so many options, we encourage you to give us a call to discuss your power objective and timeframe. Bigger is always better right? It depends. Bore and stroke are at the heart of the engine. A stock 3.0 liter motor with the right ignition and injection system can provide years of excitement. But, for big displacement enthusiasts, BreitWerks has you covered. After all, there is no replacement for displacement. Cylinder heads and camshafts have come a long way in the last 50 years. With a little planning ahead and not much additional cost, an otherwise plain motor can become a peppy and snappy power plant. BreitWerks has expert vendors that specialize in just these parts. As distributors and ignition wires wear out, your engines ability to burn fuel is lessened. Poor ignition timing can result in knocking noises and, eventually, destroyed pistons and cylinders. Newer "coil on plug" technology can be adapted to your older engine for the ultimate in ignition systems. "Twin plugging" cylinder heads and crank fire, coil driven ignition systems have been proven to be very effective for the air-cooled cars. BreitWerks can illustrate the different options that most closely match your requirements. Fuel injection systems can cause your motor to run poorly. Many of the older fuel pumps and injection components are not ethanol friendly and are having problems. Sometimes a little TLC is all it takes to correct drivability issues. Other times, the original equipment components cost more to replace than a modern system retrofit. The fuel system in the classic cars was not designed with Ethanol in mind. The effects can include broken fuel pumps, rotting fuel lines and clogged fuel distributors. BreitWerks can work to make your classic as compatible as possible with the newer fuels. The dreaded IMS Bearing... Enough said? That little bearing has been a source of much consternation. It doesn't get oiled. The solution is to use a bearing that gets oiled. There are a few different vendors offering replacements. BreitWerks will work with you to ensure we select and install the most effective replacement for your specific application. If you don't consider this as preventative maintenance, please visit the BreitWerks Engine Rebuild page to schedule a future appointment.